Nike and Adidas Clearance Sale is from March 14-18, 2012. Get Additional 10% discount on Nike and Adidas products if you bring a SM Advantage, Prestige or BDO Rewards cardholder on March 14 from 10:00am to 12:00nn only. Happening only at the SM Megatrade Hall 1 in SM Megamall. 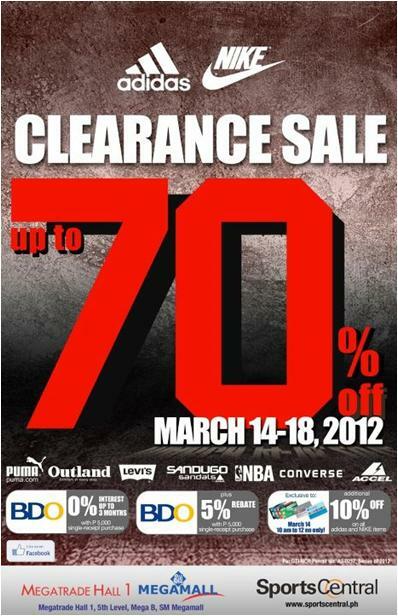 Other brands also in the sale are Puma, Outland, Levi's, Sandugo Sandals, NBA, Converse and Accel. For BDO cardholders: 5% rebate and 0% interest up to 3 months with a P5,000 single-receipt purchase.